Our industry is often described as one in which change is the only constant. As attune crosses a decade of developing, implementing and fine-tuning enterprise solutions custom-designed for the fashion and lifestyle industry, this milestone serves as a valuable opportunity to look back on the remarkable legacy of innovation established by attune, in order to gain a better understanding of where we came from and where the next decade will take us. In many ways the history of attune is a reflection of the evolution of technology in the contemporary fashion and lifestyle industry space. attune was incorporated in 2006 by an internal team within MAS Holdings (the largest apparel manufacturer in South Asia), initially responsible for rolling out SAP Apparel and Footwear solution (AFS) across the group. Subsequently, we moved outside of MAS to provide specialized skills to fashion brands on global AFS implementation projects and was now armed with the experience, which was the linchpin for attune. While it was still early stages, we strongly believed that the future of fashion would dovetail with the emergent capabilities of advanced technology. In that context, our goal was clear and ambitious. We were determined to bring together specialised skill-sets, and resources within a boutique consultancy and channel these expertise into the niche of global fashion. In the decade that has passed, technology has been, without a doubt, one of the single most important factors driving changes in the fashion and lifestyle space; both from a consumer standpoint as well as in terms of how fashion companies are run. Today’s industry is more globalised than ever, with for example: raw material from China being transformed into finished goods through specialised production lines in South Asia before being shipped directly to retail outlets across the globe. While the dynamics that led to a distancing of manufacturing and retail locations were not new in 2006, the acceleration, increasing complexity and sophistication of consumer demand that we have witnessed since then is something quite unprecedented. Technology is the catalyst that is at the centre of this unique relationship between fashion designers, producers and consumers. However, this relationship is no longer a one-way street. Today’s industry is increasingly all about comprehensive demand-fulfilment, personalisation, interactivity, and seamless omni-channel experiences. In that context, attune has been fortunate to be on the cutting edge of what is possible through technology in the fashion and lifestyle space. Tailoring tech-solutions capable of meeting these complex requirements has not been an easy feat. Today’s supply chains are more complex than ever and hence require similarly comprehensive logistics in order to function even at a basic level. Over the years, attune has adopted a three-pronged approach in order to tackle these challenges. From our inception, we were always clear on the fact that we wanted to remain boutique in nature but be able to fulfill client needs on a global scale. Where larger consultancies would operate in regional siloes, attune would offer a seamless personalised, customer-centric service anywhere in the world. However despite remaining global in scale, we have continuously worked to stay true to our roots. It is for that reason that attune is one of the few consultancies that maintains C-level involvement in all major projects in order to ensure that they hit quality and delivery targets. Our partnership with SAP has naturally been a vital ingredient in the success of the attune business model. 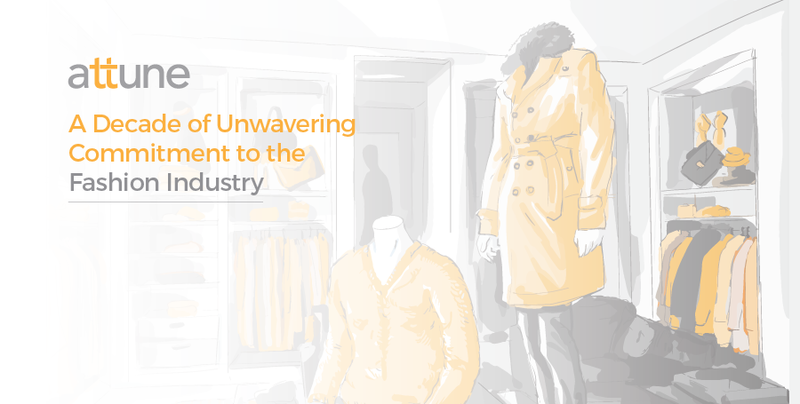 In the last decade, we have worked closely with SAP in developing solutions to meet the unique and rigorous requirements of the fashion and lifestyle industry. Our commitment to the industry was recognized by SAP with the launch of a co-innovation initiative. In that process, we have been able to apply our own experiences and expertise in order to craft adaptable, future-ready, integrated technology solutions that not only fulfil today’s requirements but also provide the agility and real-time information required to create innovations of tomorrow. The SAP Fashion Management Solution is a result of our collaborative efforts with SAP. Our ability to augment these core SAP solutions with digital tools such as mobile and web technologies to drive business value are a winning combination for fashion businesses today. Thirdly of course, our success is built on the understanding that our people are the true driving force behind our solutions. Our capacity to innovate, to ensure quality and to build relationships with such an impressive breadth of clients – from bespoke suit makers in Italy, to global apparel and footwear brands, to niche China-for-China brands – is a function of a truly versatile, determined, and deeply talented group of individuals. Our ‘globally-boutique’ philosophy is built with the idea of one global team; which helps us scale in a seamless manner and channel the best resources for the job regardless of where they are located. As we look back, we’re grateful to our clients and partners who placed their trust in us and worked with us to drive projects to a success. We can say with confidence that the association with iconic, global fashion brands across all three continents has shaped and moulded attune into a reservoir of industry know-how and expertise. Looking forward, our commitment towards the next phase of development in the fashion and lifestyle space remains steadfast. By staying true to our roots, we have been able time and again to deliver uniquely crafted, integrated technology solutions that have elevated the profile of each of our clients and enabled them in turn to create clearer expressions of their brand identity through superior product and retail experiences. All of us at attune take pride in our accomplishments to date and look forward with great anticipation to a future of innovation empowerment.